The entry fee covers your guide, support vehicle, Ceuta ferry, all camping, parking and fees in Morocco. On the Desert trip, 2 nights half board at Nomad Palace, Erg Chebbi, and on the Coast trip one night at the Palis Salam Hotel in Taroudant. Morocco is certainly Europe’s nearest African neighbour with glimpses of settlements and traffic clearly visible across the Straits of Gibraltar. Yet Morocco is a very different world. In its 700,000 sq. km there are long sandy beaches for the fun loving water sport enthusiasts, towering snow capped mountains with ski resorts, expanses of barren desert for the intrepid traveller, ancient cave drawings and striking Roman ruins for the historian. Along with crowded weekly markets, ancient dwellings, primitive agriculture and quaint mud built houses (ksour). There is the pink Morocco of the spring almond blossom, the green Morocco of the olive tree plantations and fertile valleys, the creamy white dwellings and the deep black Morocco of a Saharan night. The senses record the mixed spices of the souq, the smell of mint tea and donkeys linger in the air, the taste of tagine and the sound of the mosques calling the faithful to prayer. Morocco is not a place to look at; it is a country to be absorbed! We start our Adventure at Tarifa in southern Spain. 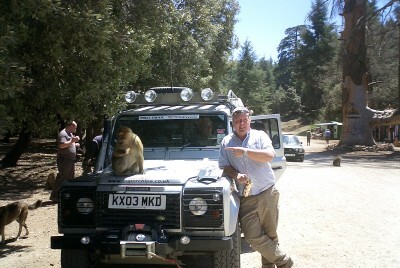 We meet at Camping Rio Jara, from where we head to Algeciras for the ferry to Ceuta, in North Africa. A short drive from the ferry we reach the Moroccan border. Having cleared the border, which can be slow, and sometimes tedious, we head south east along the coast before cutting inland to our first overnight stop at Chefchaouen, where we can stroll between the blue painted buildings and enjoy a meal in the square, watching the world go by. The next morning we set off towards Azrou and the Cedar Forest, passing through Meknes and visiting Volubilis, the biggest Roman ruin in North Africa. We will drive through the Cedar Forest where we may be lucky enough to spot some wild monkeys. We leave Azrou and drive through the Cedar Forest en-route to Imichil. We will, pass through areas populated by Berbers who have settled here, having given up the nomadic life, visit a volcanic lake, which is now a wild bird reserve of international fame. Passing through Khenifra we climb into the High Atlas Mountains, driving above 7500 ft, as we make our way to Lac Tislit, where we will camp, and hopefully enjoy a magnificent sun set, and in the morning, sun rise. 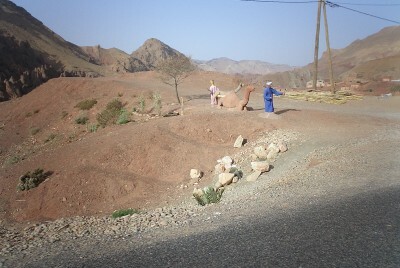 From here, still in the High Atlas we make our way towards Dades Gorges. We will climb to above 9500ft where the scenery and views are stunning and endless. The Dadès Gorges are a series of rugged gorges carved out by the Dadès River and we drive through them finally reaching Boumaine Dades, where we will camp for the night. 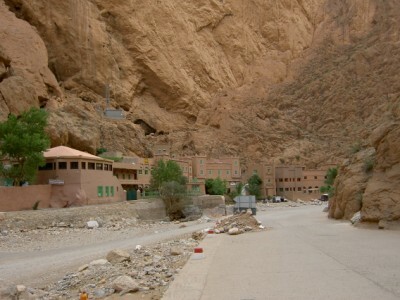 A short drive from our overnight stop we leave the road and head off into the Jbel Sarhro mountains, more breath taking scenery and views from above 7500 ft. We are heading for Zagora, via Nkob. Zagora has been a trading town for thousands of years, on the edge of the Sahara it is home to nomads, Berbers and travellers from many nations who use it as a staging post for the Sahara. 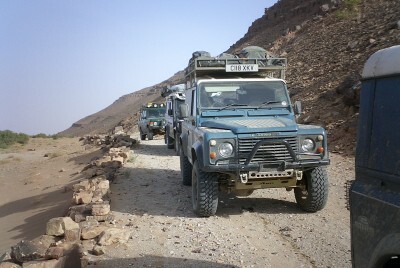 We now head east, having restocked ready for 3 days travelling to Merzouga. Into the desert for the first time, you will be amazed by its bareness and lack of sand as the ground seems black from the sunburnt pebbles. We will overnight beside Lac Maider, a lake that is usually dry, but not always. We camp in a small Auberge where we will be welcomed and able to use the facilities. 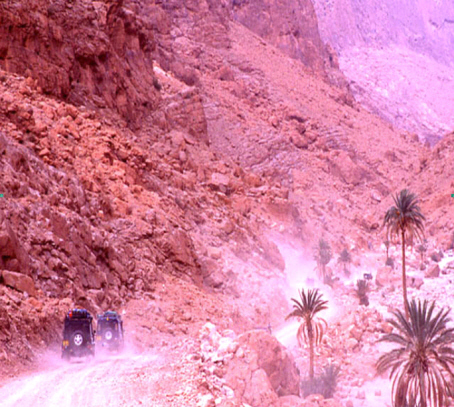 From Lac Maider we make our way to Mharech, then through a narrow cutting, pass through the mountains onto a large wadi, an area of sand dunes and bushes that has to be crossed. 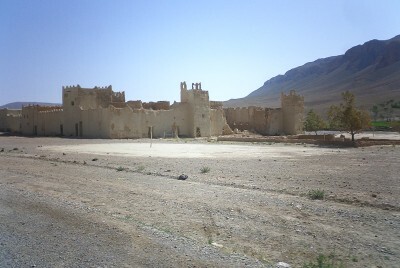 On the other side, we visit an old Kasbah, Ba Hallou, before making our way to our overnight stop. Either a wild camp or small out of the way Auberge. We set off in the morning on the last leg to Merzouga, a mix of stony tracks and sand, we start to see, in the distance, the great Erg Chebbi dunes. 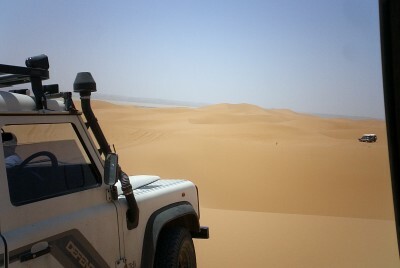 These are the highest dunes in Morocco and we will be staying on the edge of them in an Auberge for two nights. We will arrive at the Auberge early afternoon and be greeted by our host with a welcoming, traditional mint tea. Once we have our rooms we will be able to get cleaned up and refreshed ready for one and a half days, of relaxing and dune driving. 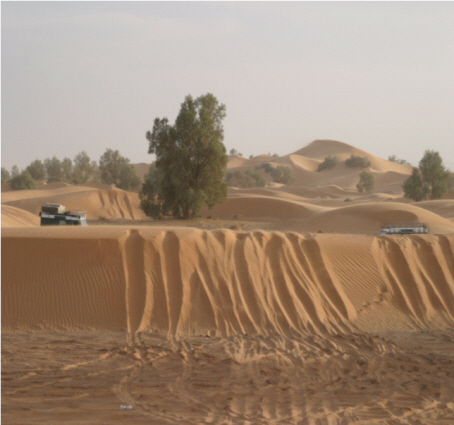 There will be the opportunity to take a camel ride into the dunes to see the sunset, or for the more adventurous a longer ride deep into the dunes for an overnight stay in a bivouac (tented village). 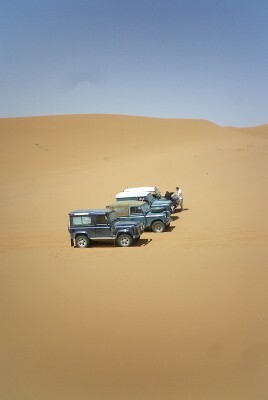 As we leave our Auberge we make our way around the great Erg Chebbi dunes and head towards Boudnib, this will be our 5th day with little or no tarmac, as we travel across rocky tracks and soft sand, slowly making our way north. From Boudnib we head back into the mountains and head for Midelt or Azrou. With no way across, or through the mountains we have to go around. A really great drive with open views that seem to go on for ever. Our penultimate day, we take to the road and make our way to Fes the oldest imperial city in Morocco. We have the chance to stay in a 4 * hotel, Les Merinides, high on the side of a hill overlooking the city. We should arrive about mid day, in time for lunch on the swimming pool terrace, overlooking the city. The afternoon and evening are yours to relax or explore. For those wishing to have a guided tour of the city and the Medina, a Unesco site since 1981, it is a maze of narrow streets and contains the oldest university in the world. The group leader will organise transport and a guide to take us, the cost being shared between those who choose to go. We must now leave Fes and travel back towards Spain. Once through the border we drive the short distance to Ceuta where you catch the ferry. This is where we will say our goodbyes, as the group leaders will either stay in Ceuta to meet the next group for the Coast to Coast Adventure, or head to Saville for our Portugal Overland Adventure. You start your Adventure at Tarifa in southern Spain. The group meets at Camping Rio Jara, from where you head to Algeciras for the ferry to Ceuta in North Africa. As you leave the ferry, the group leader will meet you. 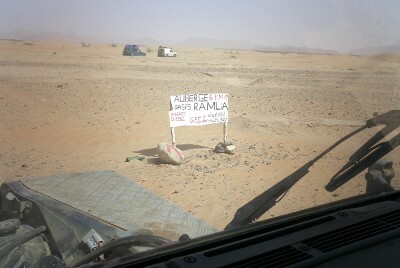 A short drive from the ferry we reach the Moroccan border. Having cleared the border, which can be slow, and sometimes tedious, we head east along the coast before cutting inland to our first overnight stop at Chefchaouen, where we can stroll between the blue painted buildings and enjoy a meal in the square, watching the world go by. We leave Azrou and drive through the Cedar Forest en-route to Midelt. We will pass through areas now populated by Berbers who have given up the nomadic life and settled down, visit a volcanic lake, which is now a wild bird reserve of international fame. 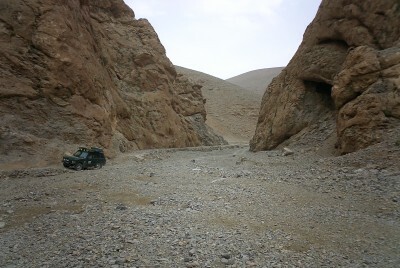 Having camped just outside of Midelt, we now make our way across country and through the mountains, reaching above 8500ft, to Todra Gorge. The sides of this magnificent Gorge are so close together that the sun only fleetingly penetrates its depths. But when it does the colours of the rock makes everything look purple. Our overnight camp is just past the gorge. 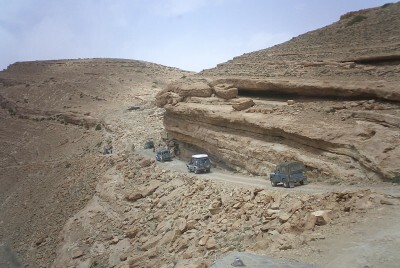 In the morning, just before reaching Tinihire, we head off into the mountains and make our way towards Zagora, via Nkob. The mountain driving and scenery are amazing, we stop at about 7500ft for a drink before heading downwards along zig zagging tracks and across open plains. 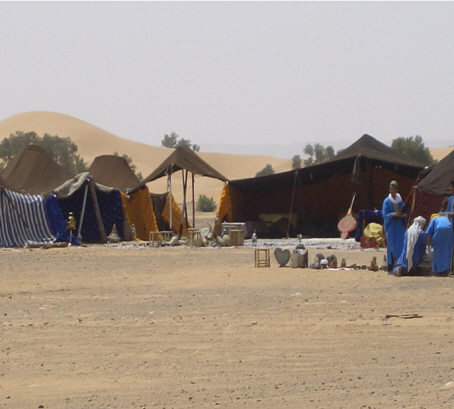 Arriving in Zagora late afternoon you have time to set up camp and visit the town. Zagora is the gateway to the desert, with plenty of shops and a thriving market. 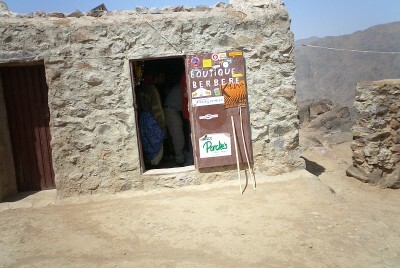 We leave Zagora at 1000, giving us time to re-stock and have a quick look around. 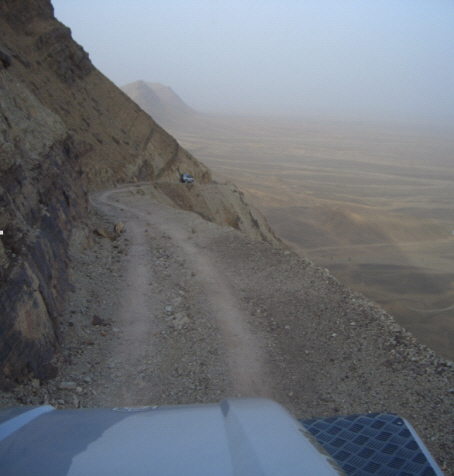 From here we head south to Mhamid, where the road stops and the sand starts. 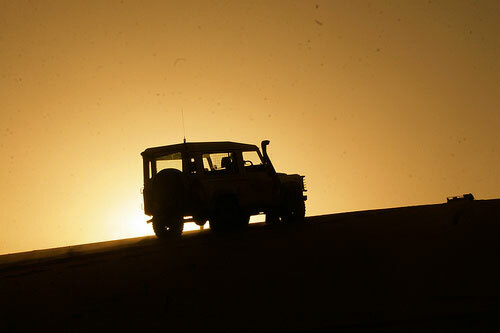 Our first real sand driving takes us towards Lac Iriki and Chagaga, where we will wild camp in the dunes. No light pollution here so the night sky is amazing, a place for time lapse photographs. 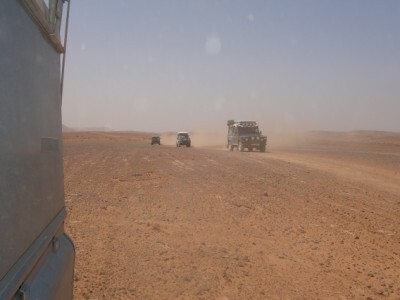 As we leave the wild camp and the sand behind we will be driving sections of the Paris Daka route towards Tata. The ground is now mostly hard and stoney with areas of smoother dried lake where we can spread out, avoiding each others dust, and getting a little speed up. 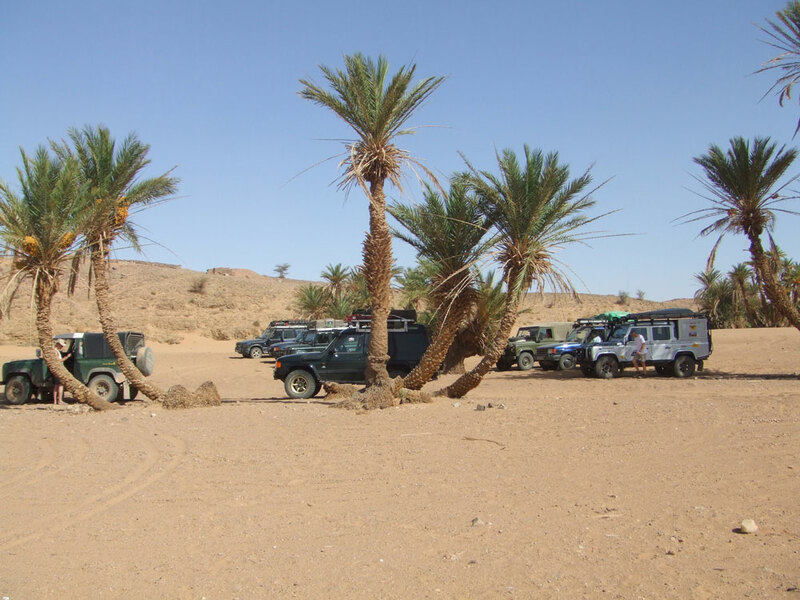 We will overnight between Tata and Assa, before heading into the Draa valley, and more or less following the Oued Draa all the way to the coast. We will visit Tan Tan, for a re- fuel, before heading towards the Atlantic for our overnight stop. Today we will be heading out across stony tracks, soft sand and sand dunes as we drive towards the cliff edge to see the Oued Draa estuary enter the Atlantic, and if we are lucky we will see a flock of pelicans wading in the shallows. From here we drive close to the cliff edge and make our way towards Plage Blanche for another wild camp in the sand dunes. A chance to drive along the beach and see a ship wreck, if the tides right. 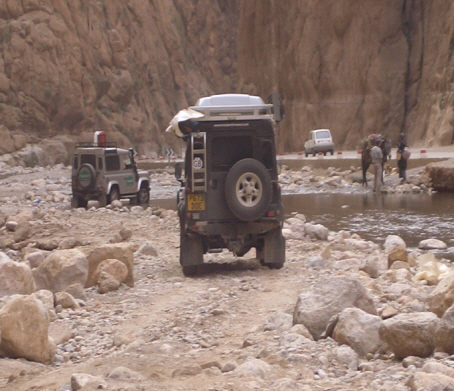 Leaving the wild camp we head along the valley, in the river bed, before climbing up onto the plateau and making our way further along the coast, at times driving along side and on the beach, until we reach our next overnight stop. 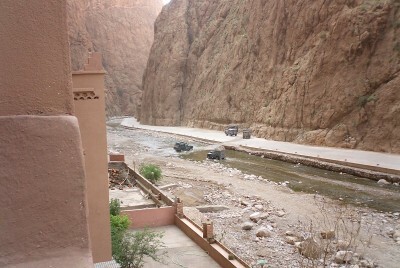 We must now head inland towards Taroudant, via Guelmim and our Hotel for the night. After 10 nights camping, including two wild camps, we will stay in the Palais Salam Hotel, on half board. This is an opportunity to walk, just around the corner, into the souk and experience some of the local shops and stalls, selling just about anything you might want. 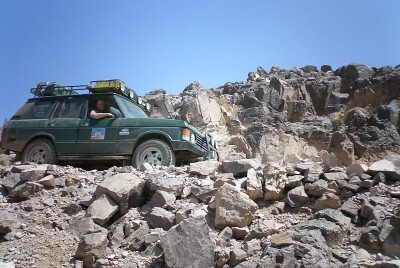 After breakfast, we head to Marrakech, via the Tizi-n-Test, pass. This is an outstanding drive climbing up through and over the mountains. We will stop for a coffee looking back over the pass we have just driven, breath taking! We arrive in Marrakech late afternoon, set up camp and have a few hours to relax. There is a very nice bar and swimming pool. The group leader will arrange for taxis to take those who want to go, into the square. We usually eat at one of the hawkers stalls and then wander around the square with all of its street entertainers, you may even see a snake charmer. 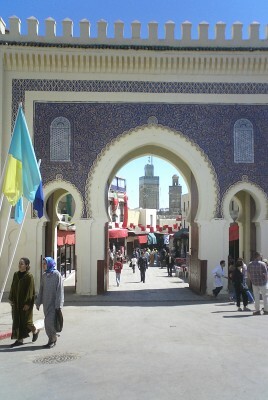 You can then venture into the medina, strolling amongst the stalls with everything from herbs and spices to ‘knock off’ watches and hand bags, then, meeting up to catch the taxi back to the camp site. 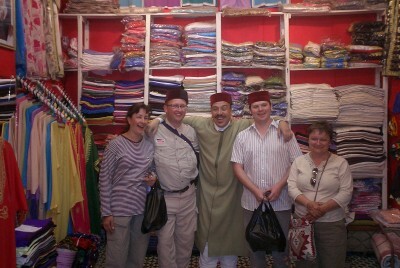 From Marrakech we must now head north back to Tanger or Ceuta to catch the ferry back to Spain. 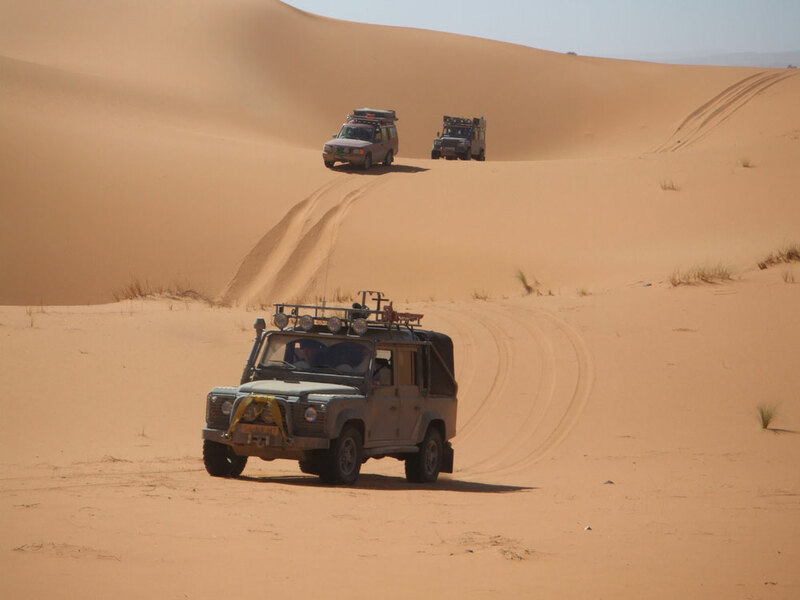 We will have covered about 2000 miles, over all types of terrain, including mountains and sand dunes………an amazing adventure. The Fee payable is for 5 to 8 vehicles, based on one vehicle and two people. We will also negotiate special discount deals for you with Brittany Ferries, for the ferry from Portsmouth or Plymouth to Santander, I expect this again to be around £745 return based on one vehicle with a berth for 2 people, depending on season. All of our safaris are designed to be achieved with well-prepared and unmodified vehicles, we are there to assist and help you . Our support vehicles and guides will be on hand to assist and recover should any situation require it. We will carry basic medical, recovery equipment and tools, but, we suggest you carry certain spares and equipment. See equipment and parts list later. Before leaving get all oils changed, a good service and have a good visual inspection of the vehicle, make sure brakes are good enough for the whole trip, and the clutch is up to desert driving. The terrain and driving conditions will vary as we get further south, from fast motorways to winding coast roads, once in Morocco tarmac and gravel prevail in the north, with shale and gravel tracks becoming more predominant as we get into the Atlas mountains. Once into the desert we get sand, volcanic rock, and the dreaded desert thorns, if you are unlucky! 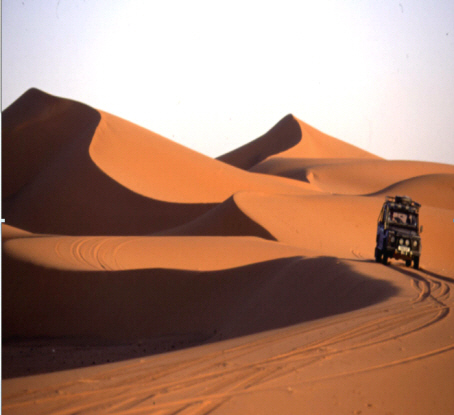 All terrain or even road tyre patterns are suitable for the Moroccan safari, but please ensure your tyres are in good condition with at least 75% wear left, the desert and barren surrounds are infamous for causing damage and excessive wear to tyres. You must be able to cover 250 miles in Morocco without refuelling so please if you think you require it bring along one Jerry can, and check the seals! We work on 22 mpg for petrol and 24 mpg for diesel engines in Morocco. 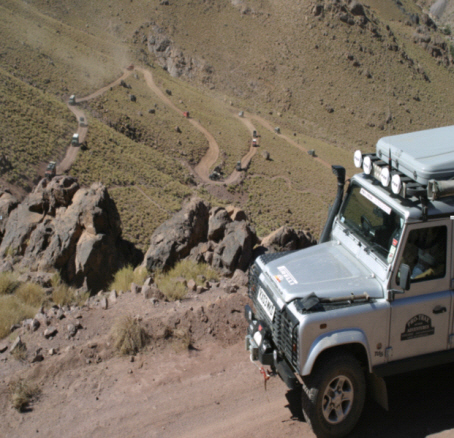 Our Event leaders, are all experienced off-road drivers with a good knowledge of vehicle mechanics and possible problems. But careful checking and sympathetic driving will minimise wear and tear on the vehicle and tyres. Vehicle documentation is very important, as are passports, driving licences, MOT’s as well as a green card for Morocco, insurance can be bought at the Moroccan border. Please bring original paperwork, along and 2 photo copies of all documents just in case, it is worth bringing along 2-3 passport sized photo’s as well, again just in case. If the vehicle is a company vehicle, you must have a letter giving you permission to use and drive the vehicle during the dates you are away. It is very important that the name on the Passport, V5 and importation paperwork are the same. 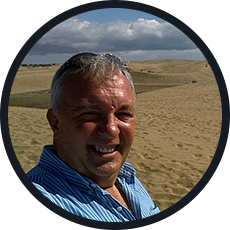 We also ask all entrants to take out travel insurance and vehicle breakdown cover, you will not get breakdown cover for Morocco but we will do our best to get any broken down vehicle back to Spain. Camping equipment is down to personnel preference but make sure your tents and sleeping bag are up to cold or even freezing nights in the desert? Camp beds or insulated sleeping mats are good, but of utmost importance is to ensure you take some tent pegs that are extra long and of a type that can grip in soft sand as well as pegs for rocky stony ground. Cooking and eating utensils are a must and make sure you bring or stock up with food in Spain (Tarifa supermarket) before we arrive in Morocco. A 20-25 litre water container is recommended as a minimum requirement. A good first aid kit with aspirin if you are not allergic to it, diarrhoea tablets/powder, sun cream and a sterile emergency medical kit. Torch and flashing light, flares, high-energy survival food, and binoculars and bottled water available. Some of our staff have basic expedition medical training and we will carry a comprehensive first aid kit. For maps, the best you can get locally to you is the Michelin map of Morocco but Stanfords in London do better and higher detail maps. CB radio considered essential for safety reasons but are illegal in Morocco so if fitted please make sure they can be taken out and hidden along with the aerials and cable when we cross the border into Morocco. Shovel suitable for sand digging! Tyre inflation system, pressure gauge, inner tube, puncture repair kits. We recommend that if this type of adventure is new to you then you should join us on one of our 4×4 driving courses which Pro-Trax run weekly and which we will give you 20% discount. We reserve the right at anytime, if necessary, to eject anyone from the event who is causing a nuisance or intentionally upsetting the smooth running and happiness of the safari. Please bring suitable outdoor clothing and boots for a varied climate and terrain!, you can never tell what the weather will do these days! Those who wish join us will receive comprehensive instructions and lists of all necessary equipment and requirements.